Vision: How does it work? 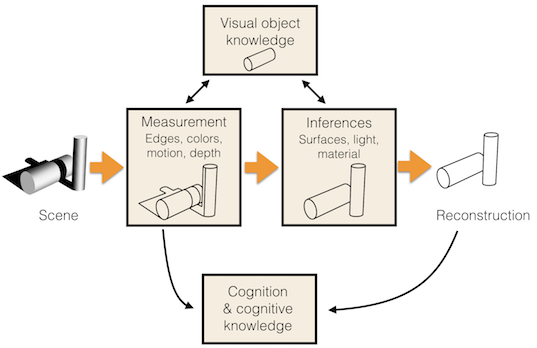 Visual processing begins with measurements of local features like orientation and color, followed by an inference stage that makes the best story to explain these measurements. The output of the inference stage is a reconstruction of the scene populated by recognized objects, surfaces, light, and shadow. Cognition may reason about information at the measurement or reconstruction stages based on an independent database of object knowledge but if it disagrees with the percept, it can rarely influence it and simply notes the discrepancy as an illusion. Much of our research uses these discrepancies between the percept and the reality to understand visual processing, and in particular, inference processes.